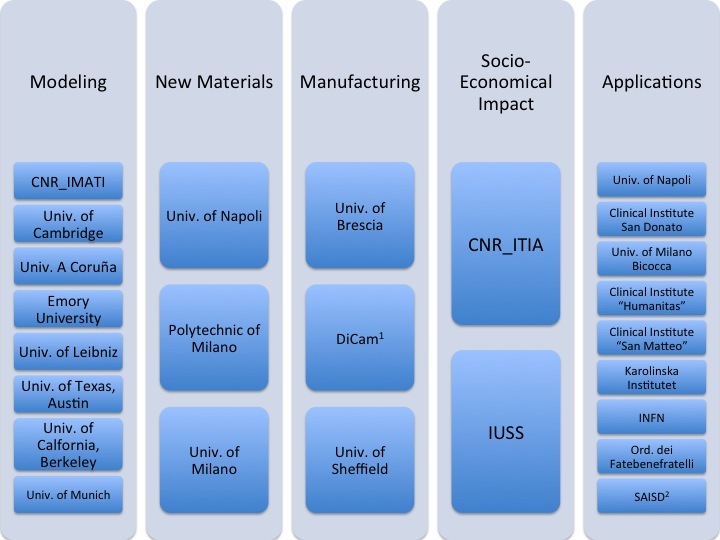 Here below are reported the International Universities and Research Centers which have collaboration activities in relations with the 3D@UniPV project. The project involves a total of 8 foreign Universities and 2 Research Centers. Computational Mechanics: advanced methods of discretization for the integrated design, optimization and analysis of solids and structural components, such as beams, membranes, mechanical modeling and computational analysis of large-scale structural membranes. Computational Science and Engineering Development of computational models for the support and optimization of metallic print. It is working on the writing of a project Horizon 2020. Numerical Analysis & Scientific Computing: Collaboration on the issues of the fluid dynamics simulation in blood vessels, in particular in cases of aneurysms and aortic dissections on patient-specific geometries. With the group of Prof. Veneziani the iCardioCloud project, funded by Regione Lombardia and Cariplo Foundation, is ongoing. DiCam is a no-profit organisation, born from a collaboration between local SMEs, University of Exeter, TNO, The National Aerospace Laboratory, schools and 3D Print Lab in the Netherlands. 3D Print Lab is located at Gate 2 and it deals with the application of additive manufacturing technologies within the Aerospace Campus. The technological equipment for prototyping is of high quality and includes a printer EOS P396 and an SLM 280HL. The goal of the collaboration is based on mutual support and sharing for research activities on prototyping technologies. Here you can download DiCam presentation. The aim of the collaboration is the realization, through 3D printing, of pancreatic prototypes with tumor mass characterization. The objectives are on the one hand the development of an algorithm for the detection of tumor mass (in phase of clinical validation) to evaluate the eligibility of intervention and the other hand the prototyping of the final model to facilitate the planning phase intervention, high complexity. Institute of Continuum Mechanics: Development of micro-macro multiscale models to describe the phenomena that take place during 3d printing process. Institute for Computational Engineering and Sciences: Development of numerical methods, in particular “phase field” methods, based on isogeometric analysis. Department of Civil and Environmental Engineering: Development and implementation of numerical methods based on finite and isogeometric elements. In the following scheme we present main contribution of national and international Universities and Research Centers to the five main pillars.